I was lucky enough to catch-up with female pro cyclist Bridie O’Donnell via email from her base in Varese, Italy this week. She is a member of the Top Girls Fassa Bortolo women’s pro cycling team. Here’s what she had to say…. Q. I read that you didn’t become a professional cyclist until you were 35, after you had worked full time as a doctor. Why did you make the career change? I never considered myself to be an athlete when I was young, although I was active. It wasn’t until my early 20s when I started racing Olympic distance triathlon, that I considered it might be something I could do at an elite level. When I started rowing, I made a change to working part-time in medicine, but always considered myself a doctor. In 2007, I finally passed the Part 1 exam to gain entry to a specialist program (Sports Medicine) but then I won the National TT Championships two months later in 2008. Then I had a choice: start my 4y speciality or got to Europe with the AUS National team in an Olympic year, in the hope of getting the only TT spot at Beijing Olympics. For me, it was a no brainer! Of course, I didn’t make Beijing and finished 23rd in the World TT Championships in Varese, so I didn’t blow the world away. It meant that quitting a full time job and stepping away from a stable and respectable career in medicine was not considered a smart move! It was never my ‘dream’ to be a pro cyclist in Europe, I just saw it as the necessary step in fast-tracking my skills, gathering experience & improving to a point where I could hope to be a world class time trial rider. I would not recommend taking on a pro women’s peloton at the Tour of Flanders for your first World Cup experience, but that was my first race in 2008 & I was very excited & terrified! I didn’t finish that race, but I did the next time I raced it in 2010 in my first professional team, riding as domestique for the reigning road world Champion, in team Valdarno. Q. I really enjoyed your impassioned letter to Mia Freedman when she made those ignorant comments about Cadel Evans winning the Tour de France. 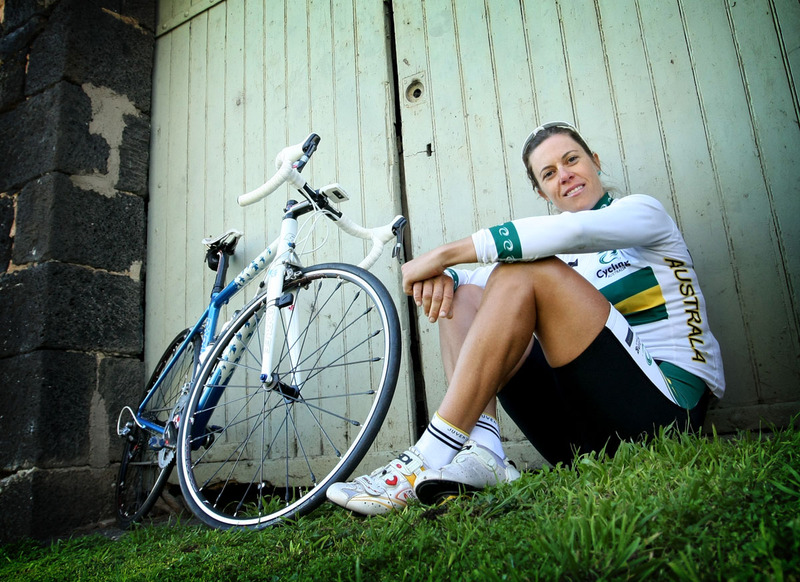 Do you hope you inspire young Australians to take up cycling? I hope I encourage and inspire young Australians to believe that they can do anything that they wish for. That no matter how much a long-shot it seems, hard work, persistence, and surrounding yourself with the best people can only lead to success. Cycling is certainly not a sport for everyone, but it definitely acts as a great metaphor for life. It’s intoxicating, wonderful, cruel, exhausting, team-building, hilarious, dangerous, awe-inspiring and creates in you a work ethic and understanding of maximising opportunities like no other sport I’ve ever been involved in. I think young Australians could afford to be braver in their decisions and they could definitely be more active! If we get more kids playing sport, riding bikes & thinking about how they can incorporate activity into their daily routine, we’ll see benefits in the health of our population, as well as a nation of better athletes! Q. Women’s cycling in Australia has a low profile compared to men’s cycling. What can we do about this? In Europe, I think some companies are beginning to understand that funding a pro women’s team costs less than 10% of most men’s teams budgets. With an extraordinary depth of talent & fantastic aggressive racing, it really is unlike anything one can prepare for in Australia. Of course, the sports media will cover and promote the events they deem to be of interest, and cycling in general gets pretty poor coverage in the mainstream sports media. But we are doing well compared to countries like Italy! La Gazzetta is a sports-only paper, and during the Giro d’Italia, the BIGGEST men’s cycling event in the country, there are still 95% of pages devoted to football (soccer). The more women that ride bikes, and the more clubs that support the development of their female members, then over time, the more races they’ll enter. I’m in a terrific club in Melbourne, St Kilda CC, and they have a fabulous women’s committee, frequent opportunities for novice and mid-level training rides, and they encourage women to race as much as possible. I think over time, we will see the growth of domestic women’s teams and a stronger field at the national road series events. The luxury of having the day to ride means I can train whenever I like (mostly). When I’m home in Melbourne, that means I don’t need to ride at the crack of dawn, and can wait til peak hour has settled down if I’m heading to busy roads like the Dandenongs or Beach Road. I have a great masseuse who lives in the next street, so I try and get a rub once/week when I’m home. Then I head to the Queen Victoria markets, just 500 m down the road, and do my shopping for the day before I have an afternoon kip. Over the last few weeks, I’ve had the luxury of having my own room, and not cramped into a bottom bunk in a room with three other team mates in a team house, sharing one bathroom between eight gals. I’m living above a great bar/caffe and I wander downstairs for a coffee there before I go out training. After I ride 3-4 hours, I make lunch, get to work on answering emails or work that I’ve been putting off. Not having a car here means that every trip to the supermarket or laundromat needs to be done on the bike, so I usually make small trips every day. I read a lot, watch films on my computer, and try to decipher La Gazzetta. If I’m not racing, I have one day off the bike every week, which is a welcome treat (something I’ve only done this year for the first time ever). It’s a mental day off more than anything: not kitting up and going through the process of riding (no matter how easy the session) is pure luxury. It also gives me no excuse not to do a long core stability session & stretch all my tight muscles in a more thorough way than during the rest of the week. A lot of my training here in Varese has been on my own, and 550-600 km in six days can get a bit dull! If I get the chance to ride w friends/pros who live in the area, then I try and make it fit into my schedule. Q. What’s it like living in Italy for 6 months of the year? Living in Italy is never dull! There is certainly no better place to be a pro bike rider, the scenery and roads are fantastic! I feel like I know how the place works a little better this season, now that I’ve been here two years in a row. Italy is about accepting that everything takes longer than it should; that yelling is not arguing; looking good is more important than being smart; and when in doubt, talk with your hands. They are more patriotic than any American I have ever met. The hardest part is living alone, and missing the people you love. Not seeing my Mum while she’s been dealing with breast cancer, chemotherapy and the stressors of being sick; having to schedule times to skype my friends; watching my nieces grow before my eyes, on weekly calls to my sister; feeling homesick hearing Aussie accents on film or TV. And not being in Melbourne to welcome Cadel Evans home after he won the TdF made me wish I was there more than ever. I’m lucky enough to be making a salary in my team, but there are hundreds of women racing in pro teams in Europe who are not making anything. Their expenses are paid, they live with family or in team houses, and frequently, they (or their families) fund their ambitions. In general, this is no rock star lifestyle. The only ones living in Monaco or Luxembourg are the pro tour blokes. Most pro women race in the hope they’ll win races, get a better contract and ultimately, represent their country at World Championships. Great interview. Thanks for bringing it to us. We are huge Bridie fans. Great interview.